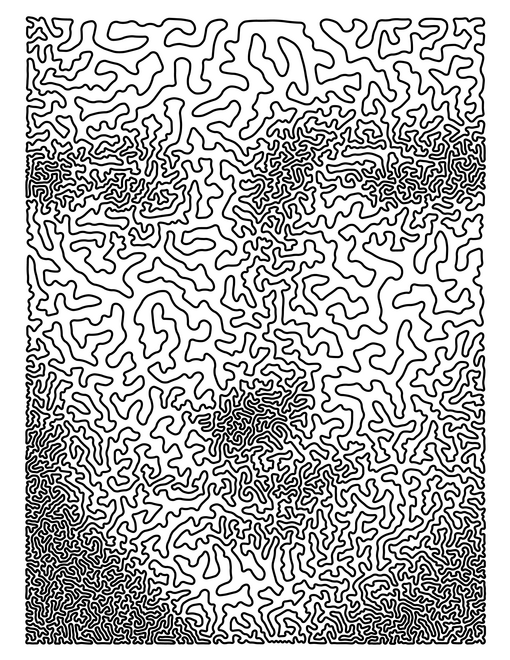 To learn more about TSP Art (art constructed by solving instances of the Traveling Salesman Problem), visit my Making TSP Art page or Craig S. Kaplan's TSP Art page. 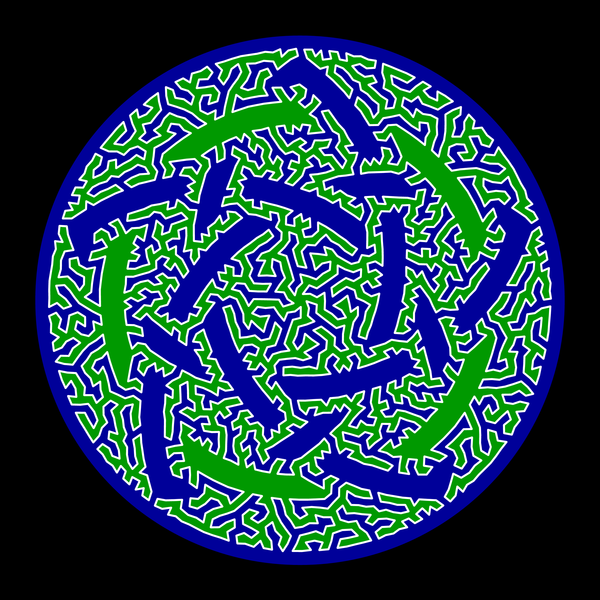 To see the "labyrinthine projections" of the artist J. Eric Morales (Mo), visit his Virtual Mo - Online Art Gallery page. 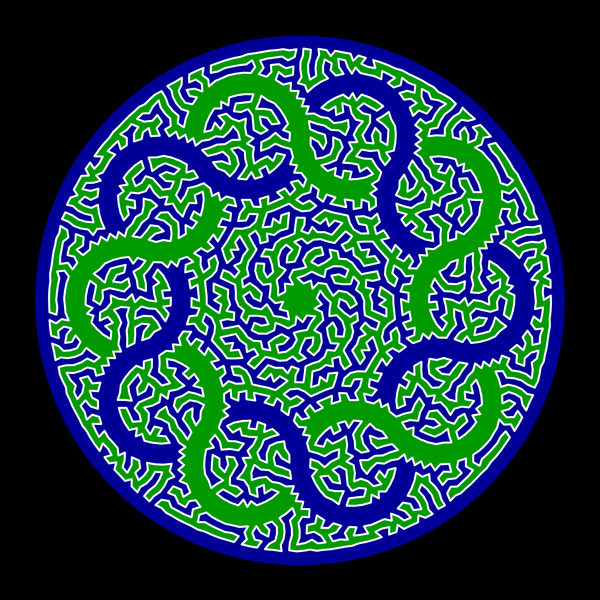 To see some of my favorite pieces of my own TSP Art, stay here and scroll down. I made this piece for the CPAIOR 2006 conference in Cork, Ireland. If you view it from a distance, you see a knotted black cord on a light gray background. 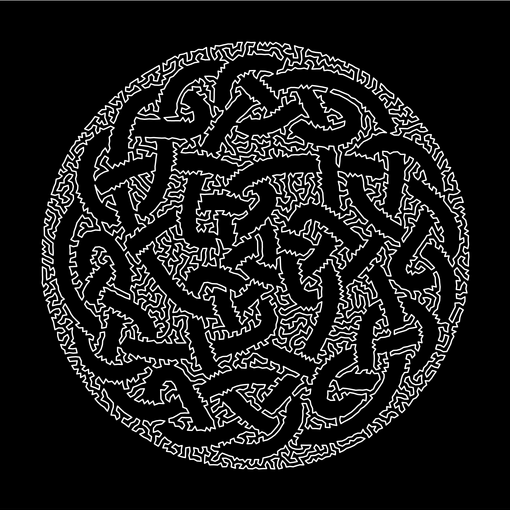 If you view it from up close, you see a single white loop on a black background. From a distance, it appears that Adam's finger and God's finger have just broken contact. Yet from up close, it becomes apparent that they are connected. 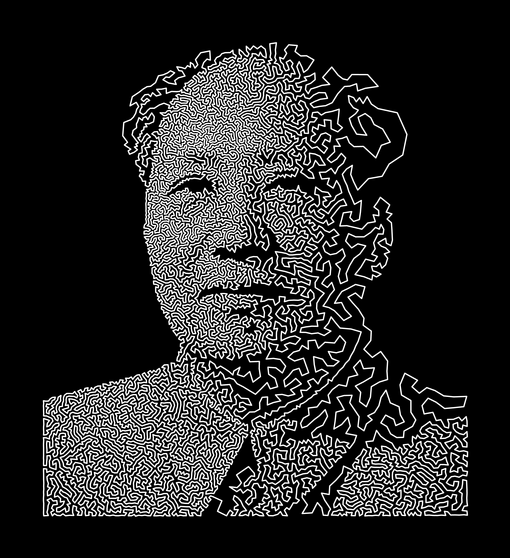 The entire picture is comprised of a single black loop. 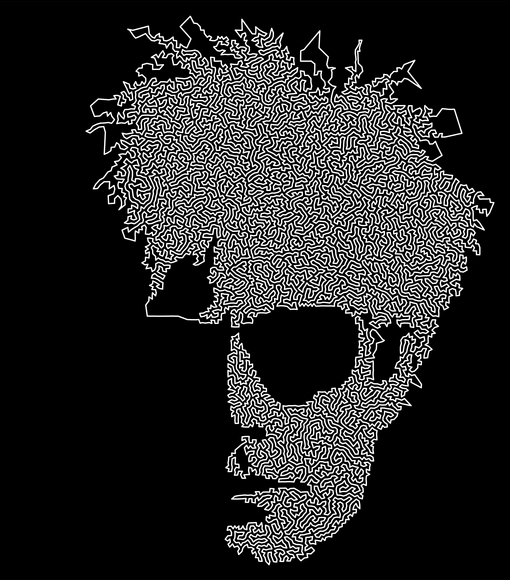 This is a series of three pieces based on the work of Andy Warhol. 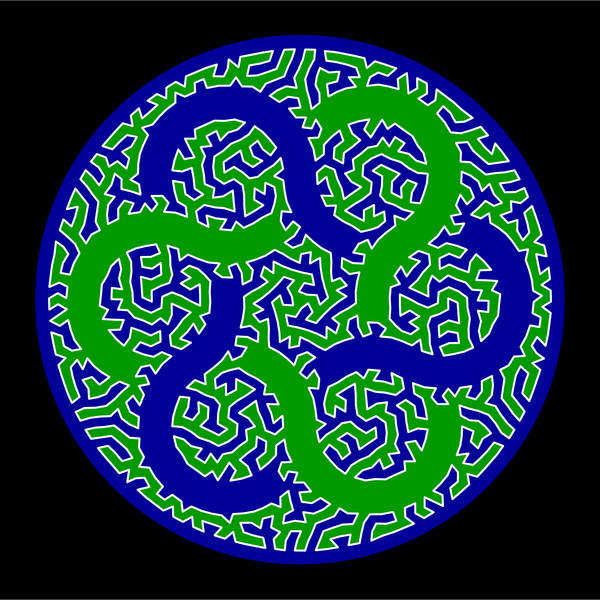 Each loop is exactly the same length (45.5 feet when printed on 8.5" by 11" paper). 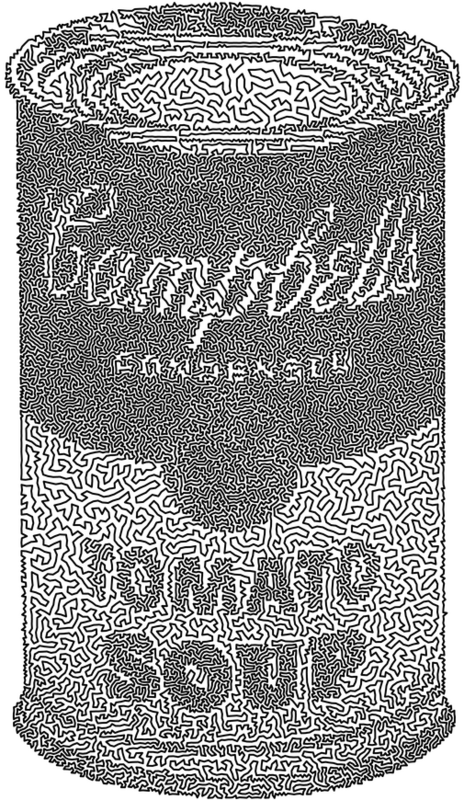 These two pieces are based on Andy Warhol's Soup Cans. The first is "Question: What's Inside? ", and the second is "Answer: This is!". 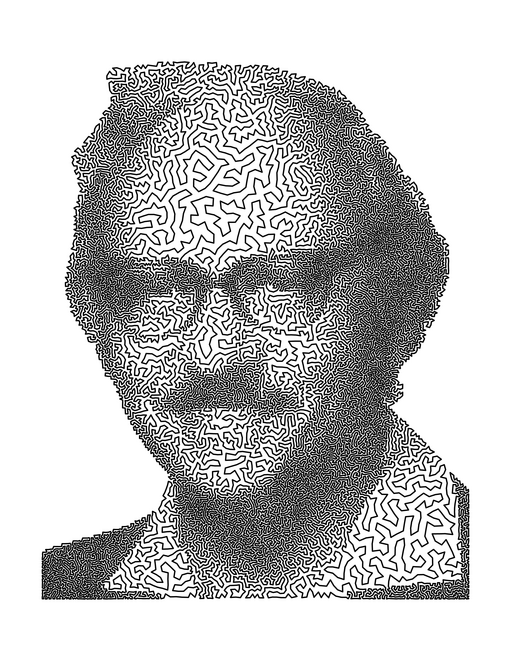 George Dantzig (1914-2005) was the father of linear programming and the inventor of the Simplex Method, the most widely used algorithm for solving linear programs. 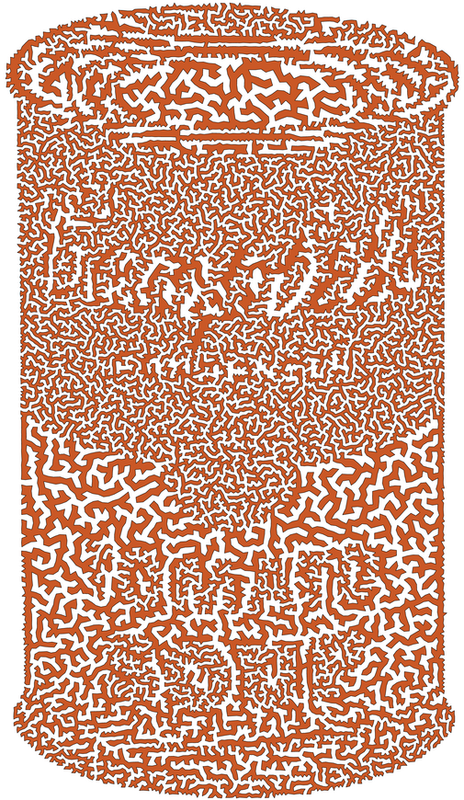 In 1954, with Ray Fulkerson and Selmer Johnson, Dantzig published a description of a method for solving large-scale instances of the TSP to optimality. 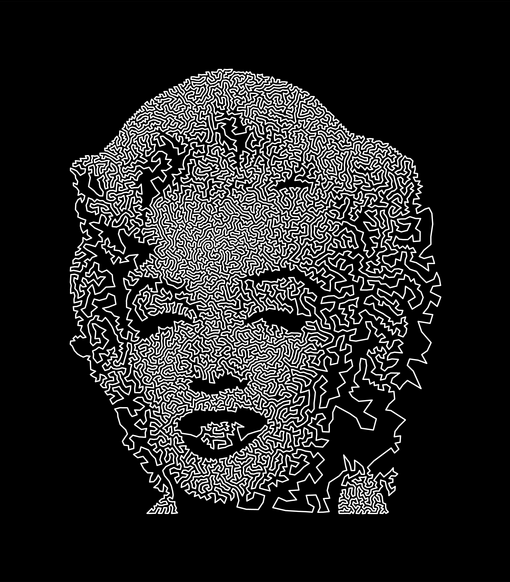 For the 2006 INFORMS conference held in Pittsburgh, I created a 25,000-city TSPortrait of Dantzig. 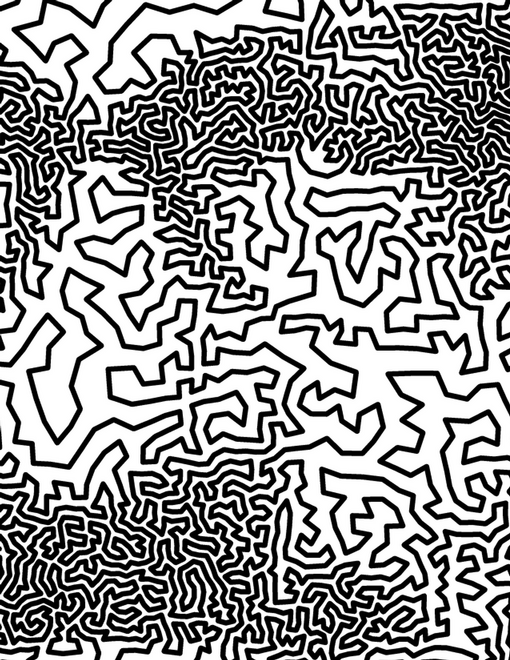 I constructed this continuous line drawing by solving a 1500-city instance of the TSP. I drew the line (the tour) with white ink. 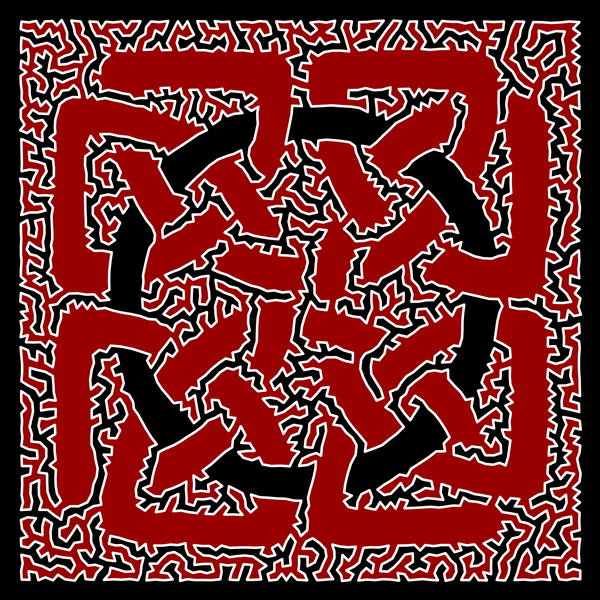 It divides the plane into two regions: In (red) and Out (black). 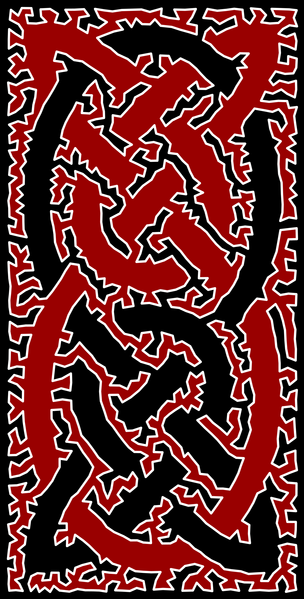 From a distance, the piece resembles an alternating link, a knot made of two interlaced strands---one red, and one black. 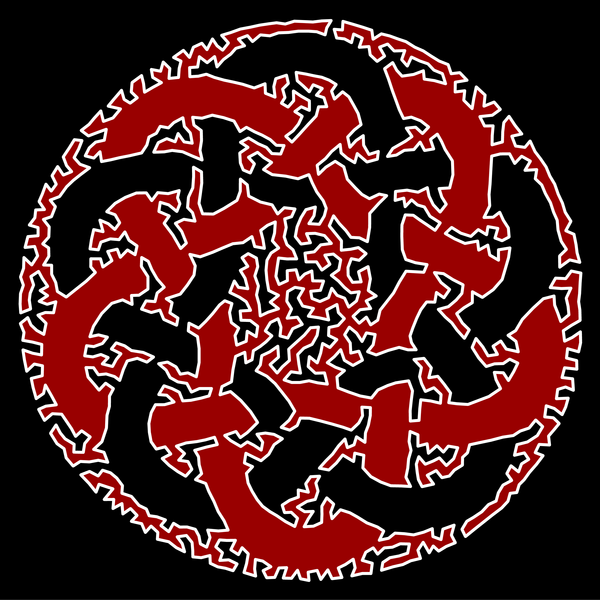 This is another piece of TSP Art in which the interior of the curve is colored red and the exterior is colored black. I based this one on a pattern designed by Cari Buziak, and I purchased the pattern from Sova Enterprises. A third piece in the series. Note that the "inner" ring is actually on the outside. Here are three pieces from a recent show. All images are copyright 2006-2009 by Robert Bosch. You are free to use them for personal and non-commercial purposes. Please check with me about any other uses.